Encrypt the cloud is the new Free Google Chrome Extension, that allows you send the encrypted messages and emails to anyone. Whether you want to send the message or emails for your business purposes or personal purposes, now you can send it secretly using this free chrome extension. Many websites tracking your personal info with your permission or without using cookies and other methods. To keep your privacy safe and secure your personal information, there are many free ways available here(We have previously Posted the best free softwares to protect your Privacy online). 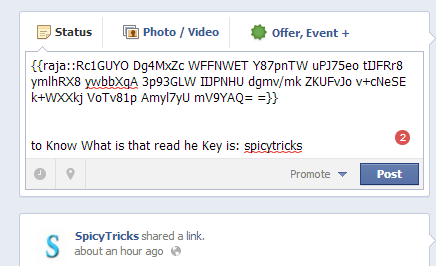 Using this extension, you can send the encrypted messages to your friends in Facebook and Gmail. The same way the messages can be decrypted using this extension with the decryption key in the receiver’s end. It is safe, now the message can be only read by your friend. Step 1 : Download the Encrypt to Cloud Extension from Chrome Web store. then click the icon of the extension in toolbar and open the demo page to know how it works. Step 2 : Second Create your keys in the Key Tab. Step 3: Now send your keys to a friend to decrypt the messages automatically. 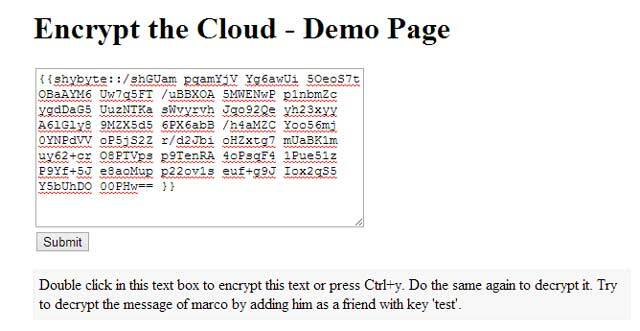 Your friends have to save that key in Friend’s key list in the Encrypt to cloud Extension. Step 3 : Using this extension, you can send an encrypted message within the website itself. For example, type the message in Facebook status text area and double-click that text area, the typed message will automatically be encrypted. I have already used this extension, it really works nicely. Try this and post your thoughts about this extension.